(Newser) – Japan may be readying itself for a mass hanging. The Guardian reports that signs suggest the long-awaited executions of the doomsday cult members behind the infamous 1995 sarin nerve gas attack on the Tokyo subway may soon come to pass. The two big indications: It reports the country typically holds off on executing multiple people for one crime until all the cases are completed, which in this instance happened in January. Second, seven of the 13 members of Aum Shinrikyo who have been sentenced to death were last week moved to detention facilities outside of Tokyo, which spurred the local media buzz. The attack: The news comes on the 23rd anniversary of the March 20, 1995, attack, which killed 13 and sickened 6,300; 10 of the condemned were sentenced for this attack, the rest for other crimes. Japan Today reports the attack, for which other Aum members are serving prison sentences, involved bags containing liquid sarin being deposited on five trains and then punctured with pointed umbrella tips. 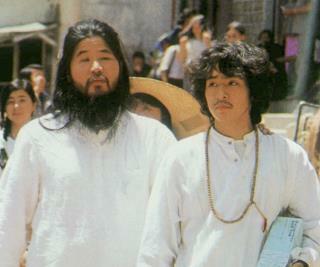 Here's wiki link on some history of this: https://en.wikipedia.org/wiki/Aum_Shinrikyo According to wiki, this group killed "13 commuters, seriously injuring 54 and affecting 980 more" and that's not counting the huge ripple effect. However, wiki is controlled fake news overall. My point is possible false flag operation but I haven't pursued research on this topic. Japan is fully part of Trilateral Commission that has powerful embedded political and controlled media factions in the US and Euro. Zbig and Rockefeller, both Malta Vatican Marxists, initiated the Trilateral Marxist fascist cult and influenced/controlled CFR; MSNBC and newser plus many more mainstream media outlets are controlled by Trialateral; Zbig's children run MSNBC, a mainstream domestic terror organization. Bottom line, very possible a complete NWO-Vatican set up. No direct evidence, however, yet possible a researcher has completed the leg work as I haven't had time to look into this history. All American (never allow ILLEGAL ALIENS A VOTE) should be allowed to vote on execution actions, once only to be dealt with for fifty years! Trump has spoken a number of times, in different locations, that drug dealers should be executed. I agree, with a MANDITORY DEATH PENALTY attached. First, every courtroom with a capital crime being presented to a jury must be on a second or third floor of said courthouse. It should be written into law that when a drug dealer is found guilty, he/she would be marched out of the courtroom through a patio style door, onto a platform with a noose waiting. The jury pronounces the guilty verdict, the MANDITORY sentence is finished within the next ten minutes. NO APPEALS, NO DELAYS!